Home » Our Doctors » Nicole Rush, O.D. Dr. Nicole Rush received her Bachelor of Science degree from the University of Oregon in 1996. In 2001 she graduated from Pacific University College of Optometry with her degree as an Optometric Physician. Currently, she serves on the Board of the Oregon Optometric Physicians Association. She is the Oregon Legislative and Third Party chairman. She has been the Education committee chairman and continues to provide continuing education to optometric physicians in the northwest as well as their paraoptometric office staff. She is also an Adjunct Clinical Professor at Pacific University College of Optometry. In 2013 she received the distinguished Minnick-Agost award from the Oregon Optometric Physicians Association for her contributions to OregonEye care. 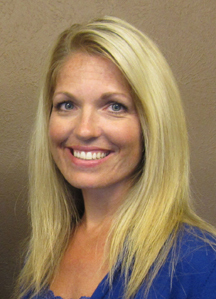 Dr. Nicole is the Medical Director of the Coquille Vision Center, Bandon Vision Center and the Eye Center of Gold Beach. As such, she sees patients in all three clinics. She specializes in the examination and treatment of eye conditions of children and young adults. August 2013 she was on the cover and a featured article in the national professional periodical.“Women in Optometry”. She has a passion for health and fitness and enjoys time with her daughters, Isabella and Lyvia.